Automotive window films have come along way. Window films not only add to your vehicle resale value, but they reduce heat, protect from glare, and block 99% of harmful UVA and UVB radiation. Window tint for cars comes in a variety of different shades that can be selected ranging from 3% VLT (Variable light transmission) to 70% VLT. Depending on the degree of darkness, you will see that the smaller the number the darker the film since it allows less light to pass through it. 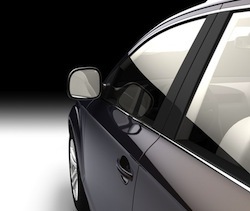 Tinting the windows on your car will also give you a degree of privacy from potential thieves while your vehicle is parked since someone can not see through the window into the floor of the back seat. By blocking direct sunlight window films offer a greater protection of both leather and cloth interiors. Which means that your interior will last longer and because the film also keeps your car interior cooler in the summer it protects leather from cracking. Because the interior is cooler with window film your air conditioner will not have to work as hard which not only saves in gas mileage but keeps you more comfortable while driving. And with the film you will not get that hot sun on your arms and legs. As with anything else there are high quality window films and low quality film available. A high quality film will save you money in the long run since it will not fade and crack like low quality films. If you are going to install the film yourself there a auto tinting kits that are pre-cut that will fit your vehicles windows perfectly. They com packaged and ready for you to install. A great place to purchase kits is WindowTint.com since they have been serving the window tinting consumer online for over 15 years and have an excellent track record for quality product and service. The also offer tint by the roll if you are going to cut the film yourself. For commercial purchasers like tint shops you should check out Starco Distributing. They offer high quality window films for home, office and cars. Whatever you decide you should consider purchasing your films from a reputable company that will stand behind their product.